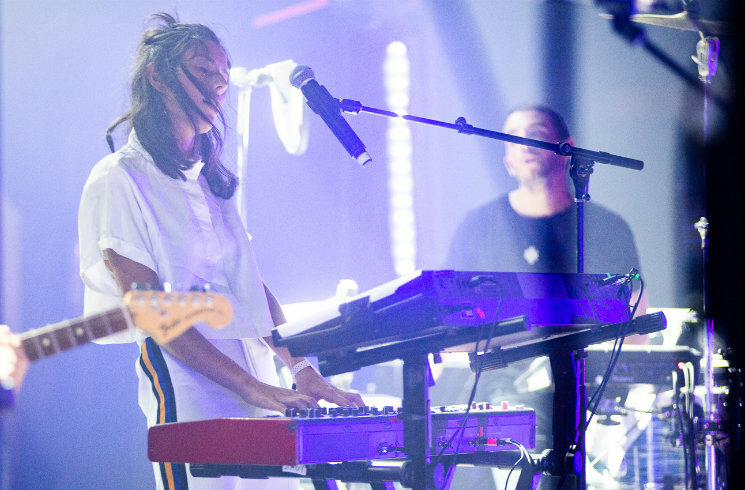 French synth-popsters Holy Two harnessed the power of performance to give their dramatic tunes the live renditions they deserved. Opening with "La Tal" from their 2013 self-titled debut, members Elodie Charmensat, Hadrien Perretant and live drummer Rémi Ferbus embellished the theatrics to bolster their tight, hooky tracks. "La Tal" made a great first impression with its bilingual Spanish and English lyrics, culminating in a rousing climax. Each synth-pop track featured Perretant's crystalline guitar riffs, Charmensat's propulsive synths and Ferbus's dramatic drums, tightly woven together in a series of well-choreographed performances. Charmensat and Perretant's vocals were clear and powerful — though Charmensat's take on rapping, as on "Misunderstood," was questionable. Regardless, when Holy Two play to their strengths, they can't help but show them, equally strong at performing as crafting a good hook.